Here at Soft-Ride, we receive a steady stream of thank-you notes and letters from customers who want to share how their favorite four-legged friends have been helped by Soft-Ride. Take a look at some of these amazing stories and, if you're so inclined, please send your Soft-Ride success story to: sales@softrideboots.com. I just bought a pair of your soft ride boots, they came today and right after I put them on, my horse felt instant relief!! These boots are amazing!! Thanks!! Thank you so much for your help last week. I received the soft ride boots on Friday and we took them to the barn to try them out. Our horse Buddy is approximately 30 years old and has several different problems. He was having trouble just walking out of his stall in the morning. I really thought it may be time to make the very difficult decision to put him down. After both boots were on, my husband asked if I was going try walking him. I was nervous just thinking about getting him a few steps into his stall! I asked him to move forward and he stepped forward with two nice large steps. I was totally amazed. We opened the barn doors and walked him out into the dooryard. He walked right off as though he didn't have a worry in the world. Amazing is all I can say about these boots. By the next morning the barn owner said he was moving 50% better than he had the last couple of weeks. He seemed very comfortable and was moving around more in his turnout this weekend and was eating better and just seemed much happier in general. I am not expecting a miracle from these boots and know it is not a cure, but we just want to keep Buddy happy as long as we can. He will be living in these boots now and would have made a good poster child for your company for sure. Thank You Again. I just want to thank you for your excellent product and customer service. If not for your product there is no doubt that I would have had to euthanize my horse, Kona. 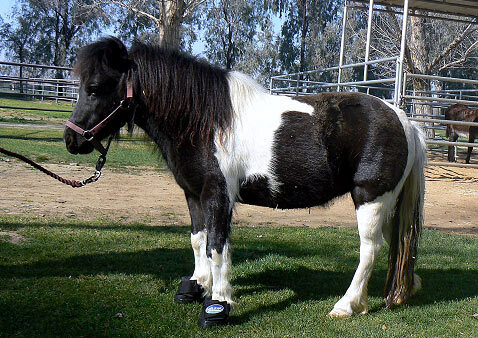 He has experienced terrible abscesses in his front hooves that appeared after a surgical procedure. It's been tough on him, but I think due to the lessened pain contributed to the wearing Soft Ride Boots, he will be able to hang in there until his soles heal. Also, your customer service is awesome. They helped me fit my horse with the correct boots, which entailed sending different sizes and inserts. In the end, after returning the boots and inserts that didn't work, my account was charged accurately with no mix-ups. Incredible. Thank you so much for everything. I will tell everyone about my wonderful experience with your product and customer service. Teddy, my 10-year-old Appendix was diagnosed with significant navicular syndrome; his MRI showed adhesions and fraying of his deep flexor tendon, among other problems. He had been fitted with corrective shoes that proved uncomfortable for him. He was noticeably lame at the walk and very unhappy (as was I). My vet put him in laminitis shoes as a short-term measure to see whether increased sole support would help, which it did to a large degree, although he was still lame at the walk. I researched various boots on line and brought the information I found to my farrier. When he saw the Soft Ride information, his face lit up and he said this was exactly what he'd envisioned helping my boy. We put the boots on Teddy a week ago Monday. He immediately walked off sound, the first time in over a month. He's been happy and comfortable ever since, and we've been taking long walks. And it is only with difficulty that I'm keeping him from bucking and otherwise expressing his joy at how well he feels. I took the boots off briefly today to give Teddy a bath, and he was immediately walking lame again. But as soon as his feet and legs were dry enough to put the boots back on, he was comfortable again. I guess he will need to be in his Soft Rides for the rest of his hopefully long life as a companion horse. Like others who have written to you, the Soft Ride Boots have quite possibly saved my sweet horse's life. I hope other owners of horses with navicular syndrome will try the Soft Ride Boots, as the support they provide seems to be exactly what a navicular horse needs. Thank you!! Anyone with a horse with problem feet needs to contact these folks. The staff is so wonderfully helpful and accommodating. My Appaloosa mare has been struggling for years with chronic founder and coffin bone rotation. I got her the Soft Ride Boots with dual density orthotics and as the staff promised, she had instant relief. It has taken her a couple of days to get used to wearing the boots, but she is walking around with much less discomfort. These boots have been a miracle for her. Thank you, Soft Ride, for all your invaluable help. 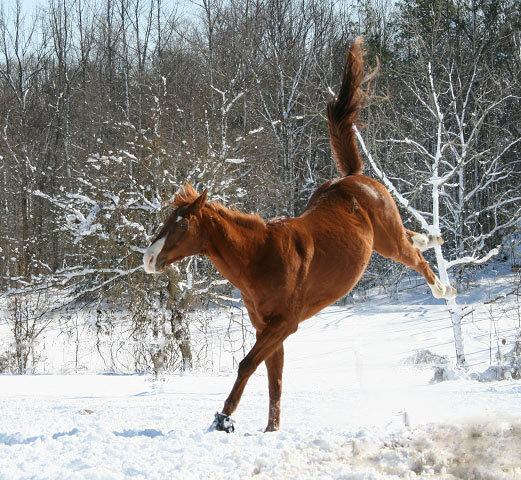 I ordered a pair of Soft Ride Boots sometime last year as a last ditch effort to save my favorite riding horse. Sonny has pedal osteitis, and none of the shoeing scripts were working. I really like the ease of putting on the boots and the longevity of the gel pad. I find the padded collar in fabric far superior to boots with padded collars in leather. All in all, the boots have held up well. Beyond well, really, as there is hardly any wear after at least 8 months. Thanks for producing a product that makes horses happy. 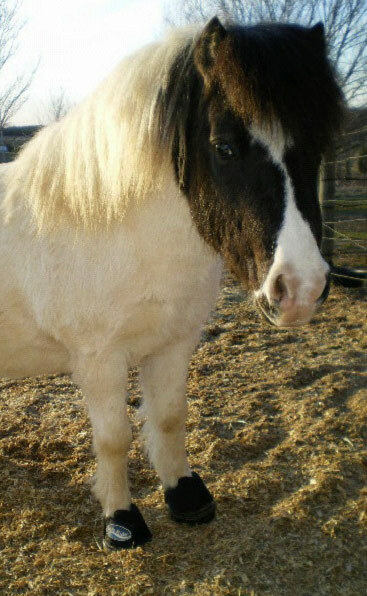 We ordered a set of boots for a friend's elderly pony that was going to be put down due to long-term chronic laminitis. The pony has had the boots on for about two weeks and has gone from limping around her paddock to marching quite happily. Her farrier is very impressed. Thanks again for a great product. Thank you for your wonderful product. Your Soft Ride Boots saved the day when my IR/Metabolic American Shetland suffered a "perfect storm" and had a major laminitic episode. I really feel that I would not have been able to bring him back without your wonderful boots. He could not tolerate shoeing, even on meds. The pain was too great and I refused to sedate him for further hammering procedures, and I could not find anyone to apply a reverse shoe as a glue-on. The Soft Ride Boots were exactly what we needed to get him through the nasty acute phase. As much as he has worn them they wash up great and show no signs of wear. Bless you for providing so much comfort while my pony is healing. He's gradually weaning away from needing boots, but we will make sure to keep them at the ready and use them for trailering and when ever Dash needs a little extra help. I am compelled to write to you to let you know that your product saved my horse, Phoenix. He has had chronic laminitis since February, and was given the 'death sentence' by vets and farriers. He's a tough old horse and wasn't about to give up, but what saved him was the Soft Ride Boots. After purchasing them on-line and receiving them pretty much within a week (considering we are in Australia, that's quick!) he was able to get up, and stagger around. He has been in them now for a whole year, 24 hours, 7 days. He is now on the mend, walking around well, still a bit 'mechanical' and stiff but my farrier believes he will be good as new by Christmas. From a horse in enormous pain on bute that laid down most of the day, unable to stand, with bleeding bed sores on both hips, to a happier motivated horse that only lies down 30 minutes of the day and is walking with comfort - this transformation was absolutely the result of the Soft Ride Boots. Now my farrier is using them on his other clients and he is convinced that it is the way to go for horses with laminitis. My equine Vet is amazed and cannot believe the results. Even after wearing them 24/7 for the last 7 months, the boots are still intact. They are extremely resilient and robust, easy to use and can easily be washed and cleaned. Their robustness has also been tested by my dog Romeo, who has had a chew on them all day without being able to put a single teeth mark dent on them. The only criticism I have of the Velcro flaps is that after wet weather, when the ground can be soft or muddy, if the horse is lying down and gets up, that action causes the flaps to come loose when mud gets on the flaps. Although this is hardly an issue as the boots' benefits totally outweigh this problem. Phoenix and I are eternally grateful for your boots - they are now saving the lives of horses in Australia who otherwise would have been put down due to laminitis. My farrier, equine vet and I are spreading the word and recommending your boots to everyone here in Sydney! Thanks again and keep up the great work! You are changing the lives of horses around the world, and more importantly changing the way farriers and vets think about the treatment of chronic laminitis. Hope all is well with you. Shooby Do is doing fantastic! My farrier says that with him being a stall weaver (when he's nervous), the Soft Ride boots are helping him immensely. He is also much quieter now on his trailer rides and doesn't kick or weave in the trailer anymore. Thank you so much for your sponsorship and for developing such a great product. I've shown them to quite a few people who have since told me that they ordered them and are in love with them. Thanks again for the wonderful support. It's great products like yours and great people who are willing to help an "up and comer" like me get to the top! My team roping "head" horse is 19 years old and has ringbone. In the past I have kept him on bute or something similar to bute. At the end of January his kidneys failed. After getting him well enough to ride I had another problem. I was not able to give him any more bute. I was going to Oklahoma City to the Dodge National Circuit Finals Rodeo and the stalls are on concrete. A friend of mine loaned me a pair of Soft-Ride boots. He told me that they would keep my horse sound. They did just that. I was there for 5 days and he (my horse) never felt better. When it was over we were the DNCFR champs. My horse feels better with the boots than the bute. My horse Bette is a 20 year old Quarter Horse mare who is a chronic founder due to neglect, shoes, and when barefoot, bad trimming. I have been working on her for the past 2 months. Just to give you an idea of how bad she was, I had to use a saw to cut the front of her hoof off just to get control of her toe area. After working on her for 3 weeks, her feet were still so painful that our vet had to anesthetize her to lie her down to be able to trim her foundered front feet. Her body is in such bad condition from her founder stance and her joints and muscles are twisted due to her twisted hoof growth. She has huge knots that we work out until our arms ache. Poor girl is in bad shape. By the way, I made boots for her using duct tape and neoprene. Worked fairly well, but Soft-Ride is greatly superior. The reason I didn't suggest putting her down was because Bette has a light in her eye, a strong determination to live. Though she has every reason to complain, she never does. My vet estimated that she had 8 degrees of rotation in her hooves when I first started with her. He said that due to her twisted hoof growth she is the worst case he's ever worked on. No doubt she has coffin bone deterioration as well. Just imagine how a horse with 8 degrees of rotation and twisted hoof growth should walk after 2 months. This is due to being on a track, no confinement- constant access to movement. I drive her around the track several times a day. She also has buddies who move her about. Natural hoof trimming is a huge part of this as well. However, I think much of the credit has to go to her Soft-Ride boots. Thanks you so much! Hi! 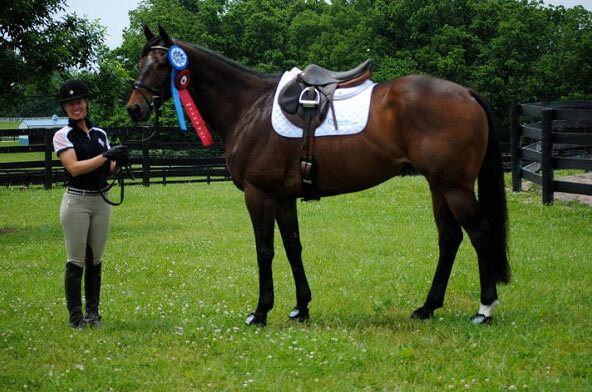 Just wanted you to know that we've just ordered our 4th pair of Soft Ride Boots for my mare, Snip. Snip would not be alive without her boots. Her coffin bone is perpendicular to the ground and she has only about 1/8th of an inch of sole between the coffin bone and the ground. With her Soft Ride Boots she is not just comfortable, she's a Wild Thing! There is no way she should be able to stand comfortably, let alone race around, bucking and showing off her big floaty trot! She takes no pain medication and is happy and loving life. Thank you! After another blizzard, the weather was clear today, so we took the opportunity to take Kisses out for a walk so she could really try out her new boots. Needless to say, it was a success. No pain meds today at all, and hopefully tomorrow will be the same. Henry couldn't resist...he needed a "soft-ride" too!! PS… you'll have to pardon the "winter hair!" Minis look more like mini buffalo around here in the winter. I know that you receive plenty of testimonials regarding Soft-Ride Boots. It is not even my style to send these sorts of testimonials. However, I feel that I must because I am so passionate about your product. 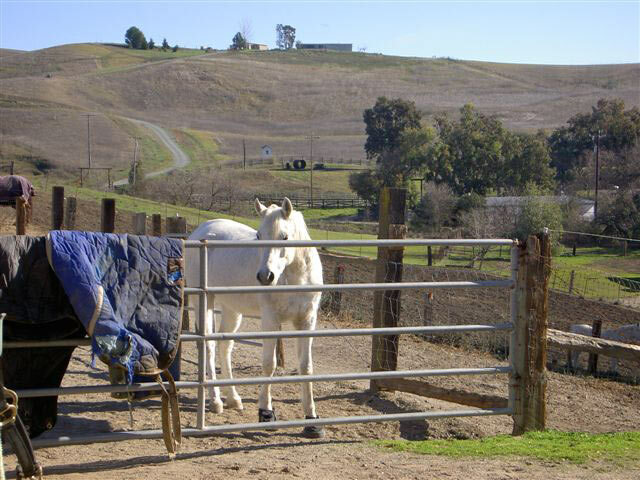 My 19-year-old Arabian gelding had severally rotated in both front feet. This horse, in the vet's own words, should not be standing or even wanting to walk! I have had him since he was a yearling and thought I owed it to him to do my very best to help him be pain free as much as I could. He had the spirit to fight! My farrier had told me about your boots. I must admit I was in a bit of a panic and worried about how I was going to be able to get through this. You sent me two pairs to try, for fit, overnight. I cannot begin to tell how much CJ loved (what we call) his "little Nike Air Jordan's!" These allowed him to walk and not just be confined to his stall and paddock. Unfortunately, the time finally came for CJ to run in green pastures forever. We just looked at each other and decided he was tired and could not fight anymore. I have told all about your amazing product. A co-worker is a professional barrel racer, with a horse that has hurt front feet. I told her about the Soft-Rides and told her she could have mine if they fit, which they did! She just returned from a barrel competition in Las Vegas and said that EVERY horse was wearing Soft-Rides! She trailered her mare home in them (11 hour ride). You have no idea how much these boots meant to CJ and me. I just had to write to let you know how Soft-Ride boots helped me with my fight. I'm glad I could pass them along to help another horse be comfortable. I just had to tell I am so grateful to your company. I purchased Soft Ride Comfort boots for my chronically Laminitic horse. I have tried everything for her: cut out garden pads, Easy boots, frog pads, 2-inch Styrofoam pads. You name it; I duck taped it to my mare's feet trying to make her more comfortable for two years. Since her laminitic episodes, Winy has been mostly confined to a stall and slowly moves around enough to get her food and water. Everyday was painful not only for her but for our family watching her and trying to make her comfortable. This last bout of Laminitis and a hoof abscess had me just days away from taking her to the horse clinic to be put down. I was searching the web and came across your web site and decided to call. I ordered, and the boots delivered three days later. I have to say I was skeptical at first. I applied the boots and stood back to watch what would happen. To my amazement Winnie was instantly more comfortable. She walked to the back of her stall with no problem and actually strode over to her window. I had to keep watching. Next, instead of the shuffle to get around she strode one foot in front of the other to get to her water bucket. When my husband came home I told him of the day's events. 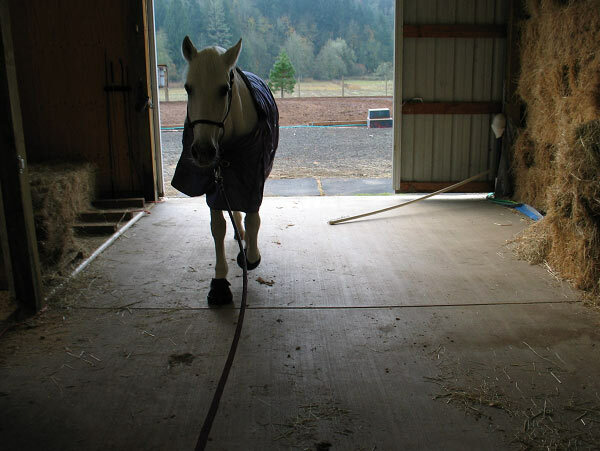 He became teary-eyed and had to go to the barn immediately to see the change. Both of us watched in amazement as she freely moved around her stall like there was nothing wrong. My daughter came home from work and I told her to go take a look at Winnie's new boots. She went to the barn and came back about 15 minutes later. She was shocked at the difference the Soft Ride Boots made. She said "Mom not only does Winnie have her feet back, she also has her carefree, loveable disposition," one that we had not seen for a long time. I have to say Soft Ride Comfort boots saved this mare's life. Three weeks later I cannot close her stall door quick enough. She is constantly trying to sneak out to talk to her other barn buddies. I can't wait until the day she can just be turned out with the rest of them. Just to see her move so comfortably has made a huge difference not only in her life but also in my family's. I am so grateful for such a wonderful product. I would recommend them to any horse facility/person dealing with Laminitis issues. I am so impressed with this product I am going to bring a pair of the Soft Ride Comfort boots in to our world-renowned lameness specialist at the horse clinic for him to see. I know once he sees the product and hears what it has done for our horse he will be amazed. Once again I cannot thank you enough for your superior product. You took a very big sadness we had carried for this mare and made it a joy once again to have her around. Just a quick update on Winnie. We finally got some warmer weather here in Minnesota and Winnie was feeling good. She was actually running circles in her stall, bucking and kicking and having a grand time in her boots. The other mare we purchased the boots for is also much more comfortable and her attitude shows it. We are using the boots every day for one horse or the other and I cannot even describe how wonderful they are. When we have one a little sore after taking shoes off, these boots give instant relief to the horse. We have an average of 18 to 20 horses on our farm, and over the years we tried many different products but none came even close. I just put in an order for another pair of your terrific "tennis shoes" for my old gelding, Charlie. He has had such a time with his feet. He is an old Rodeo champion who worked very hard in his day. We were using the boots for a while, but then he kept pulling them off and destroying them. He went barefoot for the first time this summer, but was in a lot of pain. We tried shoes with an open wedge, but that didn't help much, either. I decided to pull the shoes yesterday and put the boots back on. He is still a bit sore, but his limp is almost gone! I just really want to thank you for making such an amazing product. Our vet introduced us to these boots a few years back, and they are absolutely the best things for Charlie. He has had two Navicular surgeries (one on each foot), and they did inject some anti-inflammatory into his coffin joint, but not much luck. The boots are by far absolutely the best fix for his feet. Again, thank you so much for making such a great product. It is a blessing to our world. Thank you so much for telling me to ask my vet about the boots. She had a pair of size 5 AND the purple inserts. Must have been my lucky day!!!! I drove to her house last evening to get them and put them on Zorro last night. Oh my goodness… I put the sore foot on first and he picked up the good foot for the next one! I turned him out this morning and man o man did he prance around saying ----- look at me -- look at me. I just got the orthotics today, thank you! They will be put to good use. Notorios went leaping again yesterday. He is even thinking about trotting, I can feel it. These boots and orthotics helped save his life. I love my boy and I am hopeful the healing will continue. One of my mares had a really bad abscess and had been lame for over a month. After struggling with soaking her and rewrapping her for over a month, my vet suggested your boots. What a miracle! Almost immediately she was walking without pain and now even runs with them on. I am surprised that they stay on but they do – I was sure I would find them in her stall or paddock each morning but that has not been the case! They have made her sound in short time and have made my life so much easier. I cannot tell you how wonderful these boots are! I just wanted to take a moment and share with you how wonderful I think your soft ride boots are. I have a 7yr old Paso Fino Gelding who 11 months ago had a bad case of white line and laminitis at the same time. My vet and farrier worked together and after cutting open the front of both front hooves, extracting the white line damaged tissue and then working with heart bar shoes, vet wrap, iodine, demos, and all the other goodies, we finally got him over the worst of it. Unfortunately we had to deal with the last 1/4 inch of damaged hoof wall that could not hold a shoe nail worth a darn. I did the glue-on shoes, which bought me almost 3 weeks of hoof wall growth, but he was still walking on his soles when they fell off. My vetrifarrian (he was a farrier before becoming a vet) suggested your product. And what a GREAT suggestion it was. Storm of Angels is now comfortably living in a size 6 soft ride boot. He has just enough support on the hoof wall edges and your boot keeps a very unstable foot comfortable enough for him to move around without pain. This is a godsend of a product. The money was well worth it. Storm can now go in and out whenever he wants and is much more comfortable than being barefoot or walking on his soles. Thank you for selling such a superior boot. They work, they stay on and they clean up really easily. I'll be recommending them to anyone that asks how to keep a foundered horse comfortable. After five years of very frustrating hoof problems, from quarter cracks to severe laminitis, I finally decided to pull the shoes on my Paint gelding and put him in the Soft Ride boots. He walked off sound, and has been a relatively happy boy ever since. He was just trimmed again last week, and on the solid brick aisle, with bare feet, he had that typical "foundered" tiptoed walk. It just made me want to cry. I put his boots back on, and he walked off sound again. We're not out of the woods yet. It's going to be an uphill battle. But I'm determined to give him a full year in the boots to give him time to grow a new hoof. I understand the Soft Ride boot is not intended for riding, but I mount that boy every day in the Soft Ride boots, and walk/trot him for about an hour in a soft footing arena. The boots are holding up well (much better than I anticipated) and keep his feet dry, even in the rainy winter weather we've had. For anyone considering an alternative to shoes, I highly recommend the Soft Ride boots over any other I've tried. Our vet had told us to put down our 5 yr old mare because of laminitis. She had bedsores from laying down much and it was very difficult for her to just move 4 feet to her food. Our new ferrier says that Soft Ride boots saved our mare's life. The ferrier now is sold on your product and has 3 or 4 other horses in them. I just wanted to let you know that I bought my first pair of Soft Ride boots at the Equine Affair in Ohio more than 5 years ago. I used them for my breeding stallions to protect mares from their shoes. I've also used them on horses with chronic thrush, and each time I've used them on horses with shoes. My boots are finally in need of replacement, 5 years later! I am so impressed with their quality and ease of use that I have recommended them to several colleagues, one of which will likely be placing an order along with mine. Thank you for a great product - there's really nothing else like it! I just wanted to write to say "thank you." We are all quick to complain, but rarely do we sit down and write a proper THANK YOU. I just want to say that you all win the SUPER prize for customer service. I ordered two new pairs of boots yesterday. Before I got up from the computer, maybe five minutes later -- I had email confirmation of order AND shipping confirmation. Today, I came in for lunch, and Fed Ex was at the door with the package. Amazing. And this was "just" standard shipping, too. You people could teach half the world about service! We live in an area where most of my shopping is necessarily done on-line – and I must say that NO company has ever responded that quickly. In addition to that, I must tell you that your boots have absolutely SAVED two horses for me. One is my old Grand Prix horse, Atlanta. He is now elderly and has always had terrible feet. When we tried to turn him out for his last years to allow him to "be a horse," he was SO uncomfortable moving around that he spent most of his time lying down. We tried everything we could think of to make him comfortable and still allow him turnout, but nothing worked. He has worn Soft-Riders most of the time for about two years now, and trots and gallops around his pasture like a colt. He thanks me every day for his time with his pasture buddies and green grass. Another horse, a mare, was leased and came back to me with a badly rotated coffin bone and a prolapsed sole due to a severe abscess, and untreated white line disease. Based on previous experience, I dared not allow myself to hope that we could even save her. The Soft-Rides were a major part of her treatment. Along with a wonderful vet and some fancy farrier work – we were able not only to save her, but a year and a half later she is working comfortably and happily under saddle once again. Thank you for giving us a product that truly works miracles. The look on the horse's faces when they realize that it doesn't HURT to stand on that foot anymore is amazing. I have a founder mare with tender feet. My farrier told me about your boots so I thought I'd give them a try. After wearing your boots for only a day my mare was out and walking with such ease that I have not seen for quite some time. Also, I had one boot that separated at a seam after a few weeks. It appeared to be a rare manufacturer's defect. I emailed you and received a new replacement pair of boots at no cost within a week. Thank You so much for the great product and excellent service. Thank you for sponsoring a set of these amazing boots for the team ropers at the Canadian Finals Rodeo. I personally bought a pair of Soft Ride boots in the spring to make the long miles down the road easier on my horse. I feel that the boots had a huge impact on my horse's ability to work throughout the entire summer. If it wasn't for these boots I don't know if my 26-year-old horse would have made it through the summer. Now I believe he is feeling the best he has in years and is ready to go another whole year. So thank you very much for helping my horse get down the rodeo road. I just wanted to let you know, after our recent phone conversation, I've been treating my horse's thrush with iodine and having him wear the Soft-Ride boots. The orthotic insoles have held-up just great. His frogs are growing back perfectly and he's moving around pain free. After his remarkable comeback from a bout with laminitis by wearing Soft-Ride boots, I cannot say enough good about your product. Soft-Ride boots are amazing and like my Vet, I strongly recommend them. My horse really likes them. Thank you, for such a good, strong and durable boot that really does what you say it will. Hi! I just wanted to say thank you for the boots. 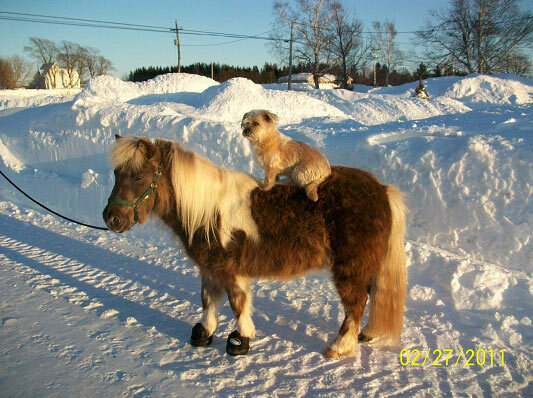 We ordered your boots for our little Shetland pony who was having such a hard with all the snow we got this year (Just outside Washington DC). He was laminitic to begin with, but his feet got so much worse this winter, he could hardly walk. Now he is running away from us! He is feeling so great! His attitude and general happiness level is so much better now that he is wearing Soft Rides. So thank you very much. I just cant thank you enough for this great product! Our Soft Ride boots came on Friday and we put them on our horse the same day. It was like night and day. She is so much better!!! She is totally off the 3 grams of bute per day and other meds! We had her in a heavily bedded stall and now she is outside 24/7 again. Her whole attitude has immediately improved and you can see she is comfortable and so much happier. I hope this will continue to improve her laminitis from her recent founder. The boots arrived today and I raced down and put them on my horse. Oh boy, do I have a happy camper now. I put them on while he was in his stall (softest dirt) and then walked him to the turn out arena. He bucked for joy as I was leading him and then after I took the halter off he ran around. He was soooooo pain free. He usually wears a natural balance shoe with a pad since he has thin soles. He lost a shoe and quite a lot of hoof wall just before a big AQHA show, so the farrier did a quick fix. He built a wall out of glue so the shoe would hold and I could show him. However, when this shoe and glue fell off it ripped more hoof wall off and he had absolutely no hoof wall on the front right side of his foot. He was lame. The farrier told me to try to keep him barefoot and grow hoof wall as if he did the glue thing again we would be in the same jam a month from now. This Soft Ride is wonderful and he is very happy. I think I'll leave it on him for at least a couple of weeks (taking it off and cleaning daily) until I try him barefoot again to see if he has enough hoof wall growth yet. Thanks so much for getting it to me so fast. Heather, her mom, Phyllis, and Warsteiner began their journey to Dressage at Lamplight at 3:00am this morning. The trip took a total of 14 hours!! Heather reported in this evening that they all arrived safe and sound. 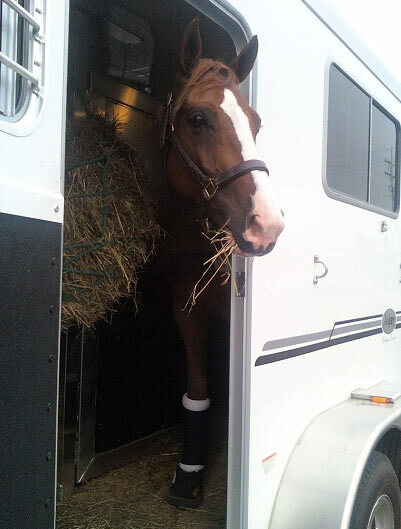 She noted that Warsteiner traveled great in the new Eby trailer and his Soft-Ride boots!!! He came of the trailer happy, perky and HUNGRY! Attached is a photo of Warsteiner upon their arrival. After 2 surgeries, 8 long months of daily bandage changing and monthly vet and farrier appointments, John Boy was officially released from vet care today!!!!! X-rays showed that his sole has almost doubled in growth/thickness on both feet. With Dr. Stevens, Dr. DeChant, Eric Farmer, Lisa Taylor, Lorraine and myself, along with his Soft-Ride Boots, we as a team worked with John Boy to beat the odds and his foot is free of infection, it is healed, it is growing healthy hoof and sole and he is pasture sound. 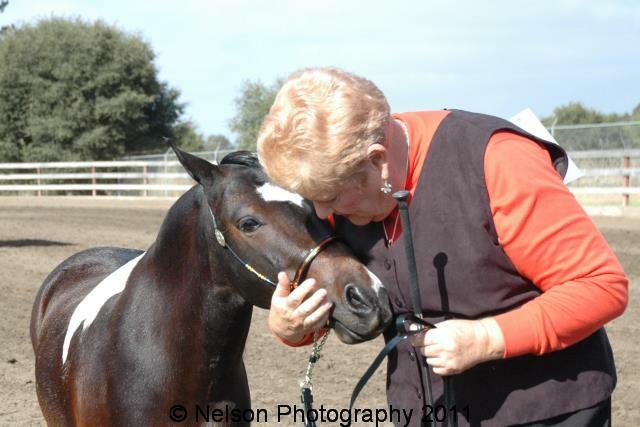 Lorraine and I have been truly blessed to still have John because no horse could ever take the place of The Boy. His spirit to fight is limitless, just talk to those who worked on him. Thanks for all your help and for making a great product!!! I love these boots, and Jasper does too! He is doing so much better in them, and moves like he used to! Ready to go in Portland's Rose Festival Parade with his Soft Ride boots. 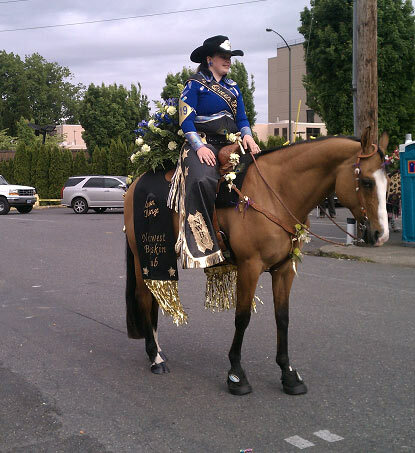 Northwest Buckskin Club Queen Kerenza Martin and her 18 year old gelding, Elliott, had a great ride in a long parade thanks to your boots. Elliott has had an abscess in his left hoof that lingered for almost 3 months. Finally got that cleared up just last week with the help the help of a great vet, Dr Jack Root. He had to dig deep into his hoof and we were concerned about Elliott's soundness for the Rose Parade. But your boots helped him make it through very comfortably and sound! Thanks for the boots. Thought you might like to see who is wearing the #9's. This is Panda, she is a 5 year AMH who presented with all 4 feet having some degree of rotational laminitis of unknown origin.